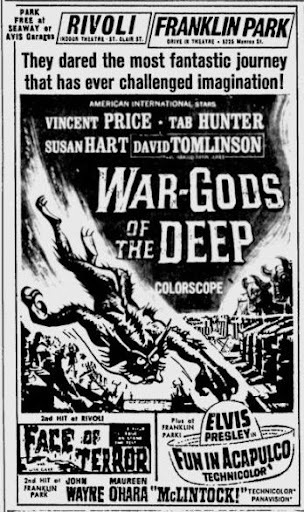 Here's an ad for War Gods of the Deep. The movie was alternately titled City in the Sea. Set in 1903, the film features a group of people discovering an underwater society of smugglers who never age living in a lost underwater city along with their gill-man slaves. Honestly, yes, that sounds awesome, but the movie plods along with lots of scenes of dialog. It's not easy to watch. It starred Vincent Price and Tab Hunter. Boris Karloff originally was supposed to play the part of Reverend Ives but was replaced by John Le Mesurier. Also starring was David Tomlinson who is better known for his Disney roles in Bedknobs & Broomsticks (Emelius Brown) and Mary Poppins (Mr Banks). As the second feature you can see an ad for Face of Terror, which was released in 1962. It's a Spanish horror movie about a scientist that creates a cure for scar tissue and mistakenly tests it on the face of a disfigured woman who is also an escaped mental patient. The third feature is Fun in Acapulco starring Elvis Presley and Ursula Andress.